Animates the value of a Vector3 Variable using an Animation Curve. The Vector3 variable to animate. The curve used to animate the x value. Calculation lets you set a type of curve deformation that will be applied to vectorVariable.x. The curve used to animate the y value. 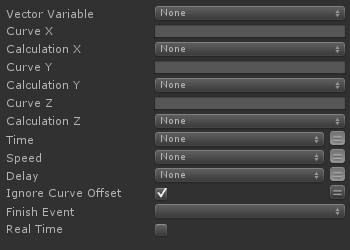 Calculation lets you set a type of curve deformation that will be applied to vectorVariable.y. The curve used to animate the z value. Calculation lets you set a type of curve deformation that will be applied to vectorVariable.z. If you define speed, your animation will be sped up or slowed down. Last modified on 11/8/2017 10:13 PM by User.